Choose your story. It means everything. I stumbled on this promo for a conference the other day. I think I would agree with this imaginary commenter in one way–this is the point of the whole thing. And yet, I don’t think the promoters of this conference did anything wrong by simply, flatly contradicting the culture and everyone who disagrees with them. In other words, this is the essence of Christian witness to the world we live in: we simply state the truth. We understand that the truths we are stating are precisely the things our culture disagrees with. We understand that the ideas which underlie these truths (these foundational truths) are denied just as vigorously. If someone doesn’t think God created humans in any meaningful way to begin with, they certainly won’t think God assigns gender. And maybe, right here, we Christians can get some clarity as to why we’d continue to keep saying things people disagree with. Maybe we could see that one thing we’re doing for those around us is inviting them to choose–choose the story you want to live in. Choose the story you want to get inside of, define yourself by, interpret the world through, and live out from within. The world is full of competing, mutually contradictory stories. Are you made by lonely, aloof Allah, from a clot of blood, waiting for the spirit to grab the prophet while commanding him to recite? Are you a chance collection of molecules, coughed up by accident from an impersonal, blind universe, headed toward oblivion while you experience the illusion of consciousness for a few years? Are you a drop from the ocean of the Oversoul, destined to be absorbed back into the Everything? Are you a bag of hormones here to propagate DNA? Are you a mystic being of light who strives to transcend all distinction and boundary on your way to divinity? See, so many people write off the Christian explanation of the world as absurd (“Who could believe that?”)–but then, let everyone produce their stories. Let’s have them all spoken openly, written systematically, and then lived out consistently. If people have a story that actually describes the whole of our existence, matches our experience, and guides their lives, maybe we’ll listen. But no, what actually happens is that people reject the good news of Christ and then live lives which are inconsistent at best, or consistently wrong at worst. Which gets us to the real point: we’re not simply preaching that people should pick a story, as if all stories are equal, and it doesn’t matter which one you pick. Only one of these stories can be true, and to truly reject the Christian story, you’ve got to personally appraise and personally reject the historical man Jesus, including his claims, his actions, and most of all his resurrection. So which story you pick is the most important decision a person will ever make. The strength of speaking about things this way, in terms of “choosing a story” is that it describes what it actually feels like to accept the gospel. It is to hear another narrative which claims to include you, and then to step inside of it and let it become your story. This seems to be exactly what Jesus did with a lot of his parables. He would tell a little story and people would have the choice–does this story include them or not? Would they step inside the story and see things from within its confines? If not, they rejected Jesus as any kind of authority. But then, his life was telling the Big Story, and he was calling all people to acknowledge that it was their story too, and that they were in it, whether they liked it or not. Everything he did was to validate that his story was the story. And so we continue his work. We know people are living out of other stories. We know their stories are often unexamined. But we preach the Gospel. We invite people to see the power and reality of the True Story. We invite them to finally find their place within what is. We have found that what is real is better news than any other story that’s ever been told. 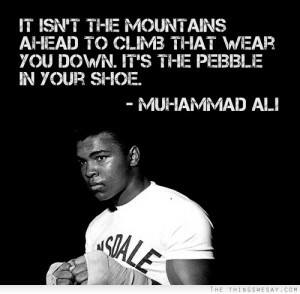 Just Drop a Pebble in His Shoe. In some circles there’s pressure for Christian ambassadors to “close the sale” as soon as possible. When pressed for time, get right to the meat of the message. Get to the Gospel. If the person doesn’t respond, you’ve still done your part. Shake the dust off your feet and move on. A wise ambassador, though, “seasons his words.” He weighs his opportunities and adopts an appropriate strategy for each occasion. Sometimes, the simple truth of the cross is all that’s needed. The fruit is ripe for harvesting. Bump it and it falls into your basket. Usually, though, the fruit is not ripe; the nonbeliever is simply not ready. He may not even have begun to think about Christianity in the right way. Dropping a message on him that, from his point of view, is meaningless or simply unbelievable doesn’t accomplish anything. In fact, it may be the worst thing you can do. He rejects a message he doesn’t understand and then he’s harder to reach next time. Now here is my own more modest goal. I want to put a stone in his shoe. All I want to do is give him something worth thinking about. I want him to hobble away on a nugget of truth that annoys him in a good way, something he can’t simply ignore because it continues to poke at him. Whether the opportunity is a short one with a transient audience or a long one with a captive audience, my goal is the same—a stone in the shoe. Some people are good “closers.” They’re good at getting the sale. What they don’t realize is that harvesting often comes easily for them because, in God’s sovereignty, many ambassadors came before them planting, watering, and weeding, one by one tending to the plant, cultivating healthy growth until it was ripe and ready to reap. Then I simply try to put a stone in his shoe. Over at the currently-being-updated website of The Christian Student Initiative (www.truthoncampus.com), we’ve posted our most recent video. This one features a look at one student’s first semester. Levi offers thoughts on what surprised him during his first semester, and how he’s seen fruit by pursuing relationships with people (including professors) who originally expressed strong opposition to him because of his witness for Christ. You can find this video on Vimeo at http://vimeo.com/113750418. They expect reality. And they should. The world has a right to look upon us and make a judgment. We are told by Jesus that as we love one another the world will judge, not only whether we are His disciples, but whether the Father sent the Son. The final apologetic, along with the rational, logical defense and presentation, is what the world sees in the individual Christian and in our corporate relationships together. The command that we should love one another surely means something much richer than merely organizational relationship, but one may look at those bound together in an organized group called a church and see nothing of a substantial healing of the division between people in the present life. On the other hand, while there is “the invisible Church” (that is, everyone who is a Christian living anywhere in the world), yet the Church is not to be hidden away, in an unseen area, as though it does not matter what men see. What we are called to do, upon the basis of the finished work of Christ in the power of the Spirit through faith, is to exhibit a substantial healing, individual and then corporate, so that people may observe it. This too is a portion of the apologetic: a presentation which gives at least some demonstration that these things are not theoretical, but real; not perfect, yet substantial. If we only speak of and exhibit the individual effects of the gospel, the world, psychologically conditioned as it is today, will explain them away. What the world cannot explain away will be a substantial, corporate exhibition of the logical conclusions of the Christian presuppositions. It is not true that the New Testament presents an individualistic concept of salvation. Individual, yes–we must come one at a time; but it is not to be individualistic. First there must be the individual reality, and then the corporate. Neither will be perfect in this life, but they must be real. I have discovered that hard [modern] people do not expect Christians to be perfect. They do not throw it in our teeth when, individually or corporately, they find less than perfection in us. They do not expect perfection, but they do expect reality; and they have a right to expect reality, upon the authority of Jesus Christ. Recently I found a multi-part lecture series by Dr. Nabeel Qureshi which outlines the basic beliefs of Islam and some helpful things to know when seeking to share the gospel with Muslims. I wanted to pass them along–they’re especially useful if you feel like you’re starting from zero and need to learn about Islam from the ground up. If you’re an Apple product user, the easiest way to listen is to grab these off iTunes U. The web link for that is here. Why believe the Bible over the Quran? Last year I met a couple of students who were Muslim, and began an ongoing conversation with one of them. This led me to finally begin (what I hope will be) a life-long pursuit of learning more about Islam, its people, and its teachings. I started reading articles, listening to lectures by Christians and Muslims, listening to debates over things like The Bible vs. The Quran, or Jesus vs. Muhammad. It has definitely been enlightening, but through it all one consistent thought has stayed with me. Incidentally, this is exactly the answer I give when people ask me why I believe the bible over the Quran. The Bible does not need the Quran to be true. The opposite cannot be said. There are multiple, literarily independent, first century historical sources that attest to the empty tomb and/or the resurrection appearances of Jesus of Nazareth. (For the very skeptical, this can be established by learning Koine Greek and visiting the Chester Beatty Library, the British Museum, and so on). Historical scholars generally agree that this is because the tomb of Jesus was empty, and his followers had experiences which they understood to be resurrection appearances. If miracles are possible, the most likely explanation of this evidence is that Jesus of Nazareth was bodily raised from the dead. If miracles are impossible, an alternative explanation – hallucination, conspiracy, swoon, other – is required. If the existence of a creator God is possible, then miracles – understood as suspensions of natural laws as a result of divine action – are possible, since a creator God could act in any way they chose. The existence of God is possible. (Philosophically, this may be the most contentious premise so far – but since anyone denying it has to show the impossibility of God, and that has proved beyond the reach of most, I consider it fair game). Therefore miracles are possible (from #4, #5). Therefore the most likely explanation for the historical evidence we have is that Jesus of Nazareth was bodily raised from the dead (from #3, #6). If Jesus of Nazareth was bodily raised from the dead, the most likely meaning of this event is that Israel’s God has vindicated and exalted him as Lord. If Israel’s God has vindicated and exalted Jesus as Lord, then we should accept and embrace his view of the way God’s authority functions in the world. (Again, almost everyone in history who believe Jesus was resurrected has believed something like this). The historical evidence we have indicates that Jesus of Nazareth believed divine authority was expressed through (a) the Hebrew scriptures, (b) his own prophetic teaching and actions, and (c) the teaching and actions of those whom he delegated as apostles. The Bible is the collection of (a) the Hebrew scriptures (Genesis to Malachi), (b) Jesus’ own prophetic teaching and actions (Matthew to John), and (c) the teaching and actions of those whom he delegated as apostles (Acts to Revelation). (It is of course open to anyone to object that, properly speaking, several of these books were not written by apostles. Rather than entering into a protracted defense of the Protestant canon here, I will simply direct the reader to Michael Kruger’s Canon Revisited, and point out that even if someone disagrees with him, they would still need to concede the authority of the vast majority of the Bible). Therefore we should accept and embrace the authority of the Bible (from #8, #9, #10, #11). Obviously I wouldn’t assume someone could be persuaded by a few hundred words–and in my experience, people who fire expletives around on Twitter are not usually looking to be persuaded of anything anyway–but I thought it might be helpful to lay out the argument, at least as I see it, both to give an example of how a Christian might respond, and to help a skeptic identify the point in the argument at which they differ. (Usually, it comes down to the resurrection. If I believe Jesus is alive, I probably accept biblical authority, even if I nuance it differently from other Christians; if I don’t, then I don’t. On the basis of 1 Corinthians 15:12-19, I think Paul would be with me on that). That last point is key. I’ve found it helpful to remember that my message to the world isn’t first, “I have the perfect book!” but (first) “Jesus is alive!” The fact that Jesus is raised from the dead is our central, most important message. The fact that the Bible gives perfect, trustworthy witness to that fact is essential, but as part of the support to our main gospel.